Each scoop 100% natural drink mix includes your daily dose of vegetables plus the added benefits of natural and organic energizers. Yes, that is 5 servings of vegetables and fruit in one tablespoon. Better yet, it has less calories and carbs than if you ate all those veggies and fruits! All Day Energy Greens® is a powerful superfood easily digestible and allows your body to absorb the vitamins and minerals completely and quickly as a whole food, not just a supplement. All Day Energy Greens® is a green superfood rich in 38 nutrients and herbs. 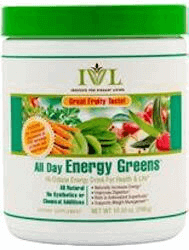 All Day Energy Greens soy-free formula with anti-aging Resveratrol and omega fatty acids has a fruity taste. Ingredients are certified pesticide-free and contains NO common allergens. All Day Energy Greens is now available in CERTIFIED ORGANIC by both the USDA and Quality Assurance International. Prefer something sweet? All Day Energy Greens is also available in a sweet fruity taste of juicy berries. It's great in shakes or simply in water. Enjoy all the benefits of the world’s best fruit in Go-Ruby-Go in every delicious glass along with your vegetables packed in All Day Energy Greens. A great comb to start your day! Vitamin C – Ascorbic Acid Natural 380 mg, Vitamin E (Mixed Tocopherols) 200IU 667%. Proprietary Blend Of: Alfalfa (Leaf) Powder, Soy Lecithin Powder (99% Oil Free), Carrot Juice Powder, Spirulina Powder, Organic Barley Grass (Ariel) Juice Powder, Aloe Vera (Leaf) Powder,Yucca (Root) Juice Powder, Rose Hips (Fruit) Powder, Acerola (Fruit) Extract, Parsley (Leaf) Juice Powder, Red Raspberry (Leaf) Powder, Ginger (Root) Powder, Watercress Powder, Apple Fiber Powder, Apple Pectin Cellulose Powder, Chlorella (Cracked Cell), Horsetail (Herb) Powder, Organic Beet Juice (Root) Powder, Organic Flax Seed Powder, Spinach (Leaf) Juice Powder, Protease, Cellulase, Amylase, Lipase, Citrus Bioflavonoids (Inner peels of oranges, lemons and/or grapefruits), Astragalus (Root) Powder, Damiana (Leaf) Powder, Eleuthero (Root) Extract, Milk Thistle (Seed) Extract, Suma (Root) Powder, Royal Jelly, Licorice (Root) Powder, Cactus (Leaf) Powder, Dulse Powder, Echinacea Angustifolia (Root) Extract, Grape (Seed) Extract, Green Tea (Leaf) Extract, Ginko Biloba (Leaf) Extract, Stevia.